The Department of Labor funded the development of the Virtual Career Network (VCN) as part of a series of grants designed to create innovations and market solutions to upskill workers. 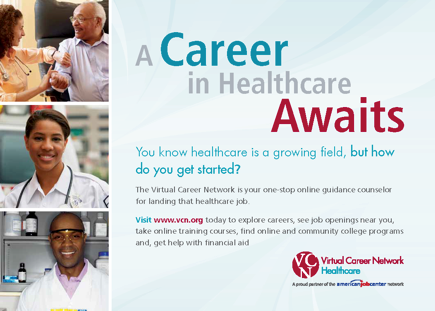 VCN Healthcare is a career exploration portal for the healthcare industry that helps under prepared workers enter healthcare jobs and develop career pathways for their long-term success. Anthology Communications worked closely with more than 25 partners to develop a communications strategy, brand and accompanying marketing materials over the lifetime of the grant. Anthology developed and implemented a communications plan to roll out VCN to diverse stakeholder groups including healthcare associations, media, workforce development groups, economic development professionals, the workforce system and employers. We performed a wide-range of communications support before, during and after the roll out of VCN (www.vcn.org). Branding & Graphic Design: Developing brand identity, style guides and templates for use by partners and grantees. Stakeholder Outreach: Meeting and interviewing stakeholders and partners to understand value-added and benefits for building VCN and how to attract users to it. This included looking at different audiences and identifying value propositions for each and tying those back into VCN messages. Communications Plan Development & Implementation: Developing a communications plan and launch strategy for VCN. This included providing stakeholders and partners with information, media pitches, canned content, tweets, social media, etc. The strategy was deemed to be most useful to provide local level implementers to communicate messages and “own” the media strategy at the local level. Materials Development: Developing messages, fact sheets, information cards, etc. for a wide variety of events including job fairs and workforce industry events.